I was so brave and got so manay stickers that I actually learned how to say the word “sticker” while there! Mummy and Daddy said that all the doctors were extremely pleased with me so we had a litte tea party on Saturday with my friends next door to celebrate. Mummy must have been very pleased as I got to eat lots of yummy cake and things I dont normally have…and I even got seconds!! And this evening…….I had my first outdoor play in the garden without my visor and protective clothing!! Daddy kept checking with our light meter and at 7.00pm, he gave me the thumbs up that the reading was Zero! 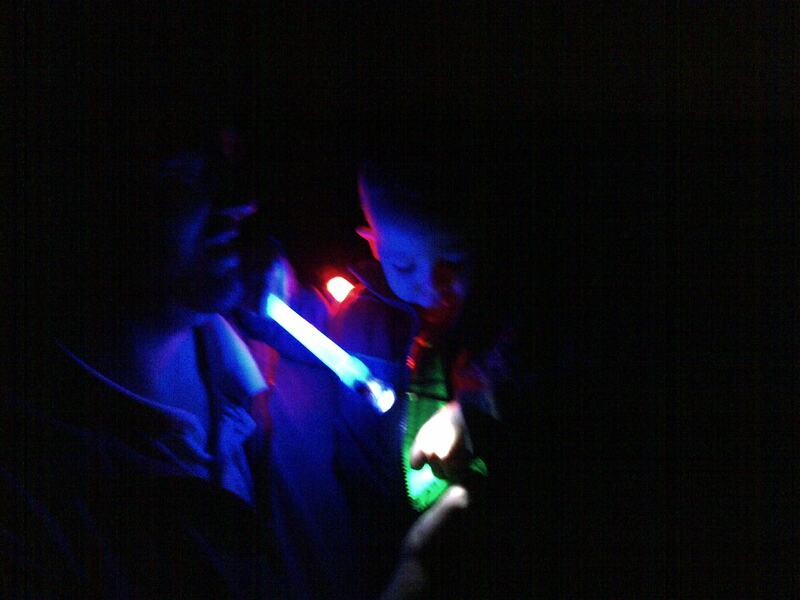 We all had sooooooooooooo much fun playing outside with fun glow sticks and flashing balls and I got to make my first mud pie which I enjoyed rubbing all over my bare hands and face! Summer Sun Isn`t Always Fun! Day 1: “baby it`s hot outside”: Mummy and I have had to stay in all day again today as it is too hot at over 30 degrees and its even peaked inside the house at 28 degrees. Mummy tells me that things inside will get a lot more comfortable after we get some air conditioning installed. It`s just so difficult for Mummy to keep us all cool when she can`t open any windows or doors. Forget cooling…don`t tell Mummy I said this but you should see the fog when she burns the dinner and can`t even open a window!!! Day 2:- “call me Alan Titchmarsh”: Another hot morning but Mummy and I decided to get straight out of bed and go outside to the garden before it gets too hot. Shhhh don`t tell anyone but Mummy was still in her pyjamas as she didn`t want to waste any time. 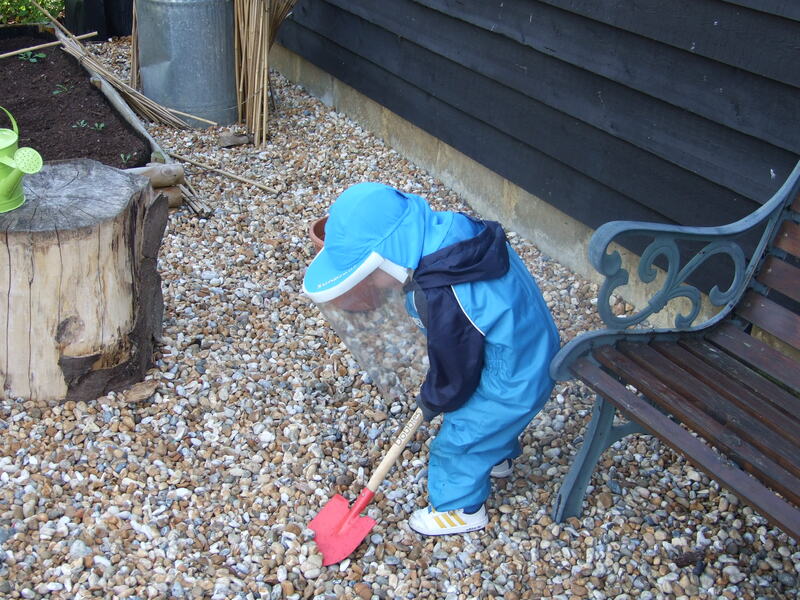 Mummy changed my nappy, applied my SPF 50 sunscreen all over, put on my UV socks and gloves, lined clothes, 2-ply balaclava and face visor…phewf all ready….and we headed out. We managed to have a lovely 30 minutes of play in the garden doing my favourite thing of watering the plants and digging up Mummy`s beds before I had to go in as I started to sweat and get all hot and bothered in my protective clothing. We headed back inside by 8.00am and after a cool down and breakfast mummy reapplied my sunscreen and got me all dressed up again so that we could go to her Midwife appointment. Mummy makes her appointments in the morning so I don`t get too hot walking to and from the car. Mummy and my Doctor have had to come up with a plan as there are only certain areas of the practice where I can safely go, and they need to make sure that all unsafe lights are turned off and windows shut before I go in. Today was very exciting as I got to hear my new brother or sisters heartbeat and I can`t wait for their arrival!! Now that Mummy`s bump is getting so big, she is finding it very difficult to lean into the back of the car to get my gloves and visor back on before we can get out of the car……especially difficult when I thought it was funny to throw my glove under the seat! Opps, sorry Mummy but I am a toddler after all! Day 3: “best of friends”: Today was very exciting as I got to go and play with my friend Finlay this afternoon. It is very difficult for me to visit friends and family as their windows aren’t safe. We have special film on our windows at home so that it is safe for me. Finlay`s mum is very clever and has made card cut outs for her windows and hangs extra curtains when I come so that I am safe. We had lots of fun playing lego and cars and getting into mischief while our Mummies chatted. 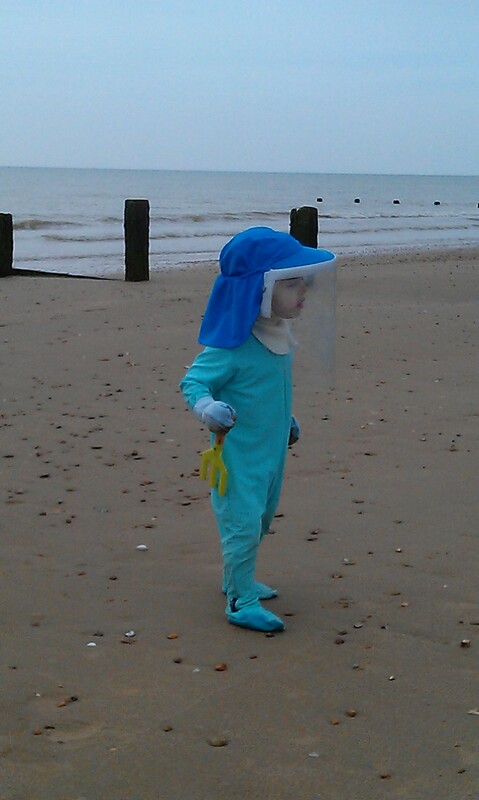 When I am potty trained Finlay`s Mummy will need to make some new screens to make the toilet safe there too. Mummy always has to find somewhere safe to change my nappy if we go out as often baby change areas and toilets aren’t safe. This will be a challenge when I am out of nappies……but Mummy and Daddy are good at challenges! Day 4:- “something fishy”: Wow…it`s an absolute scorcher today, so we spent all day trying to stay cool indoors and thinking of all those lucky baby friends who were keeping cool in their back gardens in the shade and dipping in and out of their padding pools. Daddy has promised me that I will be able to have my paddling pool indoors when they build me my own indoor garden room. I can`t wait!!! Mummy is suffering too with the heat today….she says it is her internal baby heating! Mummy got her Vitamin D blood test results today and the midwife said if they were any lower she would be a vampire! This means Mummy needs to be like me and have a supplement. As I have no exposure to the sun I will always need a supplement so Mummy makes sure I eat lots of good foods like fish and eggs which all help keep my bones strong. Luckily fish is one of my favourite foods….well this week it is! Day 5: “baby talk”: Mummy and I are feeling blue as normally today we go to Toddler Group which is made safe for me by the nice ladies who close all the blinds and turn off the fluorescent lights before I arrive. But during the summer holidays they move to the park for outdoor fun and games so I have to miss out; but I am eagerly awaiting the start of term time when things move back inside. I heard Mummy telling Daddy today that she was getting cabin fever after a long hot summer indoors and that she is really looking forward to going back to Toddler Group and having some adult conversation…..of course I don`t quite know what she means by that….I can’t imagine why she wants to talk to anyone but me!! Day 6: “beach bum”: Daddy is home today and the forecast is unusually dull (hurrah), so Daddy packed up the car while Mummy applied my sunscreen, put on my protective UV all-in-one suit and visor, packed my bag with spare clothes and we headed to the beach. We were on the beach by 7.30am so had the run of the beach to ourselves and Daddy and I had fun skimming stones and looking for shells for my nature box. This means I can take my treasures home so that I can feel the textures when I am safely at home with my gloves off. I know Mummy and Daddy are sad that I can`t feel my bare hands and feet in the sand, but they are going to let me have a sand pit in my indoor garden. After our play on the beach we went back to the car for some breakfast. It was very tricky getting changed out of my wet and sandy clothes in the car all without opening a door. I had to balance on Daddy`s knee while Mummy changed my nappy and clothes. Of course I sat still like a good boy…………although Mummy saw it differently and said it was like changing a slippery eel! We were still home before most people were up and about and spent the rest of the day playing inside. Mummy and I have to go over to feed our neighbours cat Treacle today. Mummy explained to me that even though it is just next door I still need to have my sunscreen and protective clothing on. So she set about getting me all ready so that we could pop round to say hello to the cat. It was just a quick trip and it took me longer to get ready than I was outside for but I enjoyed it as I love playing with animals and Treacle is so friendly. We were invited today by one of my baby friends to go to soft play, but Mummy explained that I couldn’t go as the windows and lighting aren`t safe for me inside; I was sad I couldn’t go and play with my friends but I didn’t mind really as we stayed home again and did some drawing and block building instead.